Figuratively speaking, that is. I just drew this portrait of him and now I want to explain why. 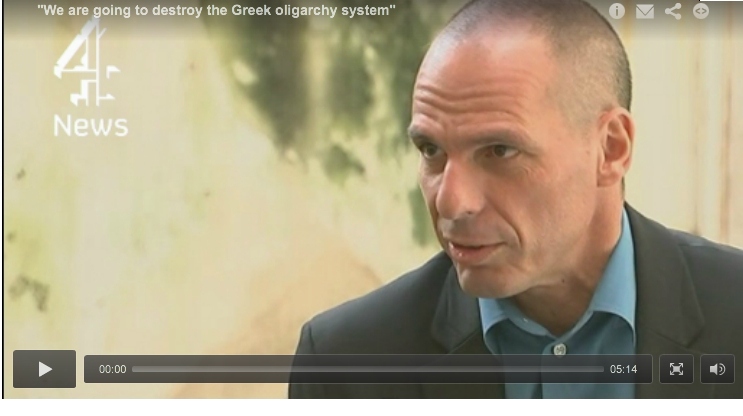 I first liked him when he spoke of dismantling the media oligopolies in Greece. His interview on that subject hit my radars at the same time as Sun News TV, the conservative mouthpiece in Canada, finally ran out of rich-guy lolly and closed its doors. The happy feeling I got from that closure primed me to enjoy Varoufakis' explanation that rich people putting their pocket change into media outlets wasn't a formula for press freedom, rather quite the opposite. 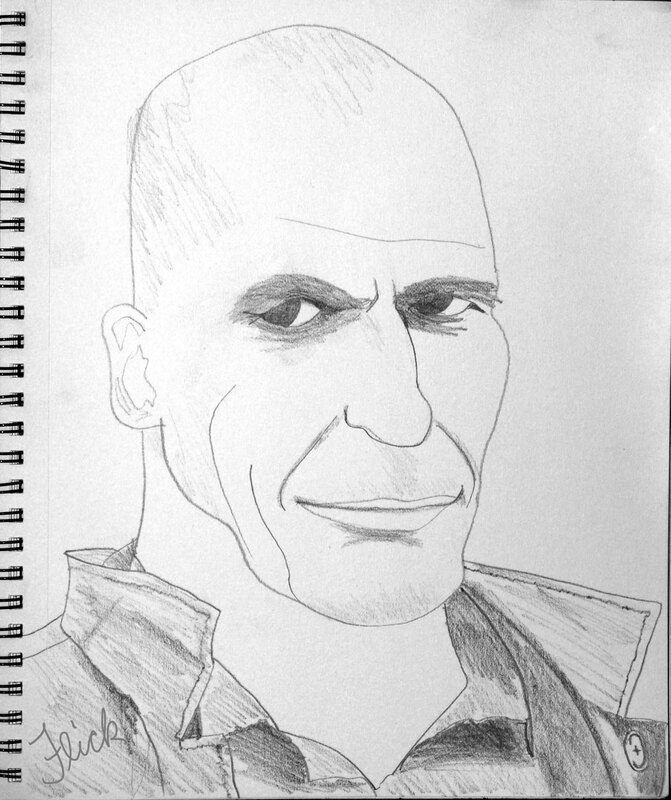 Varoufakis is the new Greek finance minister who is taking Europe by storm, or at least trying. He's the most public face of the Syriza government which pledged to cancel the cutbacks and austerity of the Euro-bailout. He's not wearing a tie in the legislature - something which seems like nothing until you realize how rare this is in a Western parliament. His casual style also helped him catch the eye of German media at a time when he was confronting their government with brick-wall obstinancy around paying back the loans Greece had borrowed under previous governments. Then he, um, caved sort of. He was once a video-game economist that helped merge one my favourite games - Team Fortress 2 - into another game, a process he described as theoretically similar to the merging of European economies, but with every transaction recorded for analysis. His blogs around that topic are nerd gold. But his stance on Capitalism - save but modify - is refreshing because it acknowledges something I've seen for a while now: that the forces of the extreme right are in a way better position to take advantage of any adventurous mistakes like wrecking the economy to convert it into something else. Leave it to the Tea Party to collapse global capitalism and play Walking Dead in the aftermath. Varoufakis became an "erratic Marxist" when he realized that Marx never recognized that his own theories could change capitalism, and create Marxist power centers that used the theories for their own advantage. Marx also failed to take human imagination and life itself into his equations. People never actually add up as cogs in the productive machinery that would lead to the collapse of Capitalism that Marx envisioned. Good god, could it be the Varoufakis is a true anarchist - fusing Marxist analysis, practical democracy and _____? !